Time for some straight talk about the stock market, since nothing has improved fundamentally. Congress has passed no financial reform, the Federal Reserve is financing a new equities bubble on Wall Street, and the real economy is on life support. According to our technical runes, the market is overbought but unlikely to correct more than 7 percent any time soon. 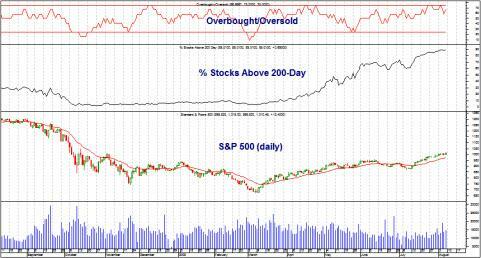 Below is a daily chart of the SP-500 showing the overbought condition. The upper window contains my proprietary Overbought/Oversold Indicator, which peaked on July 28. Below that is the percentage of stocks over their 200-day moving average. This reached an overbought reading of 89.01. 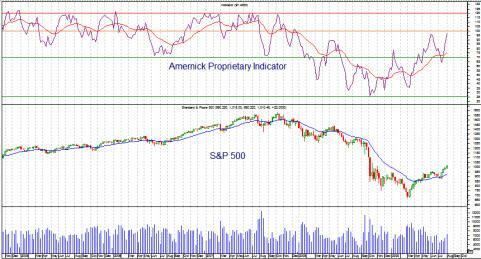 As the SP-500 approached an overbought condition, investor sentiment has turned euphoric. The upper window in the chart above contains my proprietary market sentiment indicator. The indicator shows that sentiment has moved from panic (last October) to near euphoric conditions. And here’s something for all of you market-watchers who care about fundamentals: The current trailing Price/Earnings ratio of the SP-500 is 148.47! If current earnings of $6.86 were to increase fourfold by Q4 2009, that would leave the earnings at $27.44 and the PE of the SP 500 at Friday’s close (1010.48) at 36.83. The 48% rally since March 6 has already priced in 2009’s earning’s growth. The market rally has been fueled by the vapors of Fed liquidity. That liquidity will slowly disappear during Q2 and Q4 of 2009. Already, the six-month rate-of-change in the Monetary Base is -2.7%, and the six-month rate-of-change of M3 is -3.66%. The Fed is slowly moving toward a more restrictive monetary policy. If you combine the sentiment readings with the overbought technical condition, you are given few choices but to take profits as we move into August. We must respect the fact that the six weeks from September 1 to October 15 are the most vulnerable weeks of the year. The easy money has already been made. Traders will face a more difficult environment during the next six months. This market is going to top out between last week’s high and 1050. And this fall is going to be nasty for the bulls. I looked at a 10 year Dow chart…getting above 9500 looks as difficult as scaling a smooth and slippery 90° cliff with your barehands and barefeet. I don’t think we will hit the 10k mark that so many are eyeing. but with all due respect for Mr Amernick, how can market corrections be no more than 7% after the Fed withdrew the M-3 punchbowl at more like a -11% annual rate, the S&P sold up to 148 times contracting earnings, and credit defaults accelerated while the GDP contracted at a -15.5% annual rate? Is that why the NYT came out for eliminating GDP like M-3? Why would A be taking profits in August if any stock market corrections are going to be shallow? Like the born again calves after +48%, was he bullish on Friday 6 March 2009 until this month? Our worry is more about enough liquidity to get stopped out at a fair price. Will there be another Bank or Exchange Holiday as Sir Harry Schultz thinks, the SPX closing at 1000 and opening at 100? We still think cash is king dollar and even Prechter may be right now.